We will analyze the short term and long term goals of your business, perform market research, and study and analyze your audience. All of these elements will be combined with proven marketing tactics to develop the perfect social media marketing strategy for your business. Each post will include an image, video or graphic and caption that specifically accomplishes your marketing goals, accurately represents your brand and engages your audience. Say goodbye to stressing over a last minute post each day, because we do the posting for you! All packages and customizations include one facebook account and one Instagram account. Interested in having us manage more accounts? Message us! We have a range of additional services that you can combine with your social media management package to further optimize your social media marketing. It’s time for a social media face lift! The services below are created to optimize all aspects of your social media accounts! Creating a branded, visual and user friendly experience for your customer. Running low on time? Below are a number of services to both optimize and ensure the quality of your customers experience while simultaneously removing tasks from your no doubt over flowing plate! 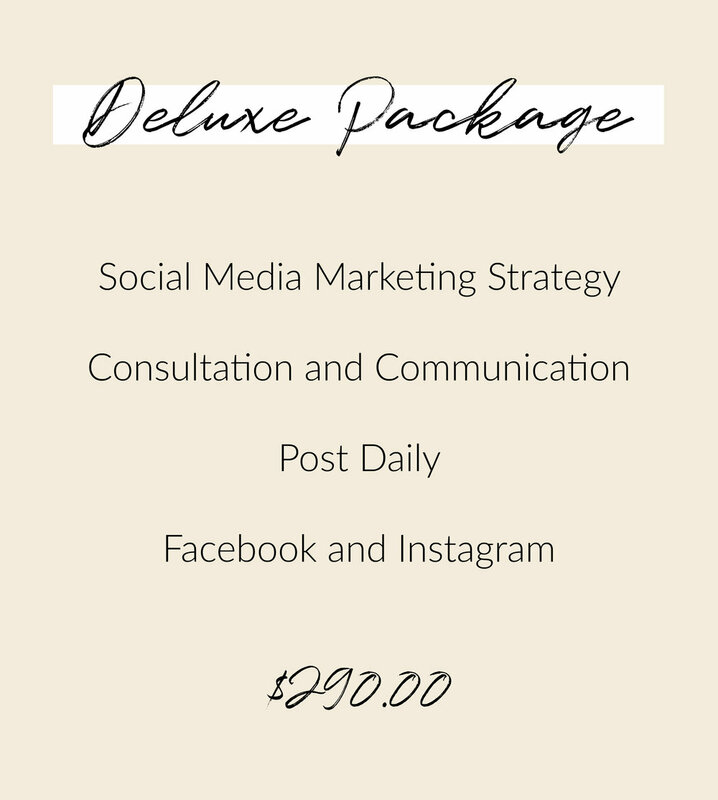 An invoice will be emailed to you to purchase your social media management package. Packages are billed monthly. Have questions? Send us a message!